I have two fall-back meals that I can always count on when my imagination fails me: There are my tacos (quick shrimp, or shredded pork) and there’s my risotto. Risotto, sadly, has gotten a bad rap because it requires you to hover and be attentive for the entire time you are cooking. (Sound like someone else you know? Who is possibly hanging on your apron as you read this?) In my opinion, though, this flaw is cancelled out by the fact that risotto falls in the hard-to-screw-up category (along with that braised pork loin I wrote about last month) and can be open to interpretation as soon as you nail the fundamentals of its preparation. Not to mention the fact that having a stash of leftovers in the fridge is money in the bank for dinner the next night, too, in the form of golden, crispy, melty-cheesy risotto cakes. My suggestion: Save your apron-hanger’s dedicated screen time til dinner prep hour then turn on one episode of The Backyardigans while you stir the rice and get Zen. I was so happy when Trader Joe’s started selling organic string cheese. We always have a stash of them in the fridge, which came in handy on risotto cake night. This can be a nice side with roast chicken. Or if you add enough stuff (see instructions below), it’s a meal all unto itself. Warm about 4 to 5 cups of liquid (I usually do about 2/3 broth — chicken or veg — and 1/3 milk) in the microwave. In a medium saucepan set to medium-high heat, add olive oil and one pat of butter. Add 1/2 onion (chopped), salt and pepper, and stir about 1-2 minutes. Add 1 1/2 cups of arborio rice and stir until every grain of rice is glistening. Add about 1/3 cup of white wine if you have it and stir until the rice absorbs all the liquid. (If you don’t have wine, just skip to next step.) Start adding your hot liquid about 1/2 cup at a time and stir until most of the liquid has been absorbed. Repeat this step for about 20 minutes, then start tasting the risotto. It should be tender with a little firmness. (You may end up not using all your liquid.) At this point, stir in none or any of the following: peas, cooked crumbled Italian sausage, cooked chicken, cooked mushrooms (cut into small bites), fresh basil. 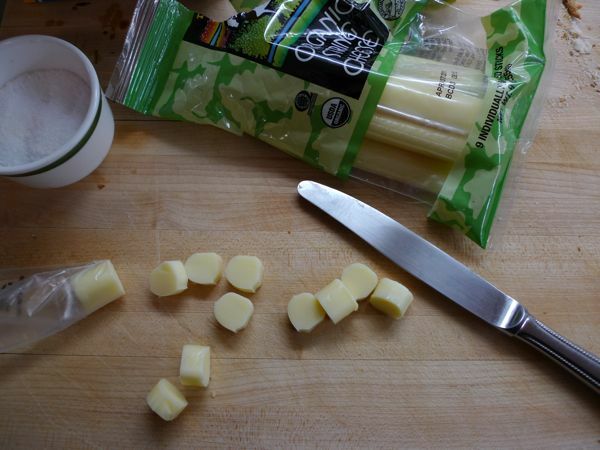 Remove from heat and stir in generous handful of grated Parmesan and a little more butter. 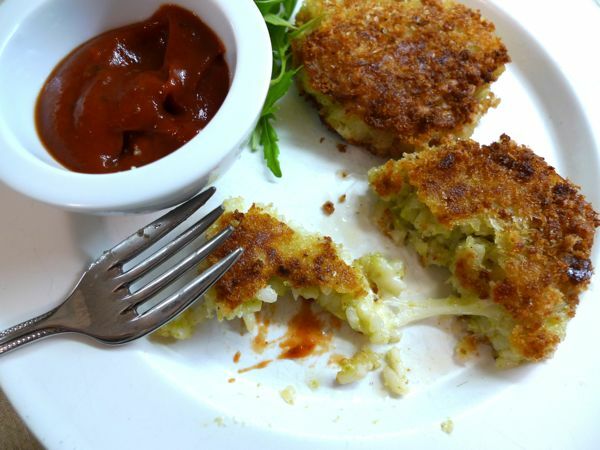 Serve and save any leftovers for risotto cakes the next day. Set up dredging stations: 1 plate flour, 1 plate whisked egg, 1 plate bread crumbs that have been salted and peppered. Add a generous amount of olive oil to a frying pan set over medium-high heat. 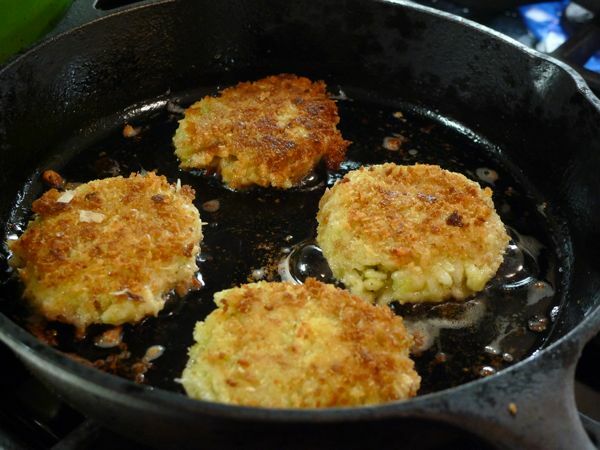 Using your hands, form small patties with leftover risotto. (Wet your hands a little to prevent stickiness.) Take a small bit of mozzarella (as shown above) and, using your thumb, wrap it in the risotto cake gently so it’s covered by rice. Gently dredge the cake in flour, egg, and bread crumbs, then fry for about 1-2 minutes a side until it forms a nice golden crust and rice is heated all the way through. Repeat with remaining risotto and serve with marinara sauce or ketchup and a green salad. If you are cooking in batches, keep finished cakes on a plate under foil or in a 200°F oven. This sounds so good. I was just on the way to the store for the week and I think we have something new to add to the menu. I hope I am up to the task with the risotto. I can break bad for me but I am not sure I take enough time with it. Nice! I adore risotto and love that you’ve turned them into cakes. Love making risotto! I rarely have leftovers to make cakes from the next day, but occasionally I will do that and serve it with a salad or something. Jaime Oliver has a really good recipe (got it off the Food Network site) for risotto with roasted garlic and thyme, delicious. I also got one somewhere online for risotto with fresh corn and bacon, that one was really good in the summer, although it might also be doable with frozen corn. I made risotto for the first time last night. The kids said it was kind of bland. But, I didn’t try any add-ins. Tonight- Risotta cakes and there are PLENTY of leftovers, so I hope that I do better with these. Wish me luck! I am making risotta cake tomorrow and wondered whether you have suggestions for what to serve with it veggie-wise. I am making it with a roasted red pepper sauce. Any advice you have would be awesome. Tried this and loved it..cheese just makes any meal very tasty and mouth watering to anyone.